At first glance it appears to be just random gibberish. However, closer study shows this to be a very confused rendition of the drinking toast "L'Chaim", which in Hebrew means "To Life!". 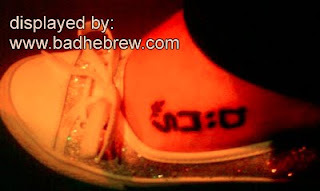 Celebrating life with a drink is all well and good, but I'd advise against getting Hebrew tattoos while under the influence. Trust me, when the room is spinning, that's not the best time to either get or give a tattoo. You might get stuck with something really embarrassing. Like a drinking toast. With randomly rotated letters. Written backwards. Simple genius: it's meant to be viewed with one's head in the toilet and feet against the bathroom mirror. And read as as sarcasm: 'LeChaim, beseder, aval lo le ha-chaim ha'elle! (to Life, yeah right, just not..um..THIS Life!) Typo, I take it there's a maximum blood-alcohol level when planning a tattoo? it reads like "sukat" to me. Actually, all the letters are in the proper orientation, just meant to be read UPWARDS!!! (from toe to ankle) and with the yuds next to each other.